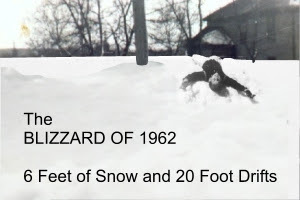 In late December 1962 the perfect storm of the century hit Maine with 6 feet of snow in places, and 20 foot drifts. Normally Maine snowplow drivers can keep up with heavy snowfall by driving non-stop day and night, but not this time. This storm was a nor’easter, and she won the battle as the blizzard of the century closed down the entire state. My job was to shovel out the car which was parked in the yard. First I had to find it. Before that I had to go upstairs because the only exit was through a bedroom window on the second floor and onto the shed roof. Next, I stepped off the roof, or perhaps I should say up. It sure wasn’t down because drifting snow was up to the second floor. With broom in hand I began poking the handle into the snow until I heard a clunk. Continuing along, no clunk meant I found the edge of the car, and within 15 minutes I had a perfect outline poked in the snow. The next step was shoveling out about a foot from the outline, and then 6 feet down to get to tire level. An hour or so later I was done for what it was worth. It would be a few days before roads were clear to go anywhere. Back then Derby had a post office, and a zip code. Both are gone, so today Derby will be found under Milo, and if you plan on a visit don’t bother searching for a Holiday Inn. Anyway, back to the storm… the post office finally opened and to enter you stepped down into a 6 foot square hole to get to the door. Someone in my family must have that photo of our porch from the 1962 storm. The main door was through the porch, and the entrance was a tunnel, and in one photo of my Mom it looks like she’s crawling out of an igloo. Ayuh. That was a good’un.